The PLOTS visible/near-infrared camera tool was ready to fly on Thursday, but the Fled could not find enough wind. So I switched on the two cameras and the timer and walked around the field making photos every 10 seconds. At midday on Sunday. With a north wind, we looked into the sun a lot that day. There was good sun and enough wind to loft a camera on both Saturday and Sunday last weekend, and the apples were just starting to bloom. So I knocked on Barney Hodges’ back door and introduced myself. Barney bought a 200 acre dairy farm in 1974 and started planting apple trees. His son runs Sunrise Orchards now, and Barney seems quite content to be in his beautiful old farmhouse in Cornwall surrounded by thousands of apple trees that he planted. He graciously permitted me to fly a kite and take photos, and I did. Ever since I backed the balloon mapping Kickstarter project, I have been thinking about what to do with the matched pair of visible and infra-red cameras I will receive next month. I’m intrigued by the idea of making NDVI images by combining information from the two cameras. NDVI maps of vegetation can reveal new ecological patterns, but I still have no idea what I might learn with this tool. 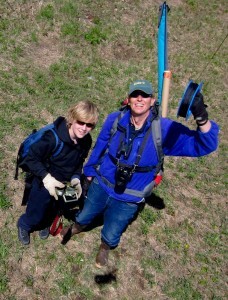 I have also been thinking about how to deploy the cameras to take aerial photos. The level of my Kickstarter pledge entitles me to a kit with cameras and other things, but it is not yet clear what other things will be included. So when it was 50° a couple of weeks ago and tolerable to work in the garage, I started playing with a piece of one of the aluminum storm window frames that were thrown behind the shed. The goal was to make a cheap, lightweight, self-leveling rig to hold two cameras pointing in the same direction: down. 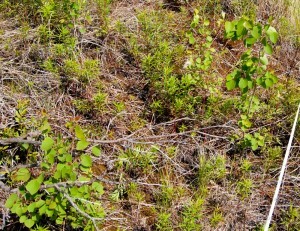 Aspen seedlings and fireweed in a burned study plot. While in Alaska in June I visited some mountain treeline study plots we established in 1998 to describe and monitor the population of white spruce at the transition between subalpine forest and alpine tundra. I searched the plots for new spruce seedlings and remeasured the ones that had been previously located and marked. A wildfire burned through some of the plots in 2004, and a new tree species has since established where the organic soil was consumed. Thousands of seedlings of quaking aspen now grow in the plots, and I recorded their number and height in subplots. These are healthy seedlings growing in the tundra where, prior to 2004, the only trees were a few stunted spruce. This invasion will be either a short-lived experiment that ends when the aspens try to grow taller than the winter snowpack, or the start of a novel treeline community. Monitoring these plots will eventually reveal how this plays out, so in the meantime counting and measuring a few things is considered to be science. It took a couple of weeks for Jeffrey Warren’s message to sink in. 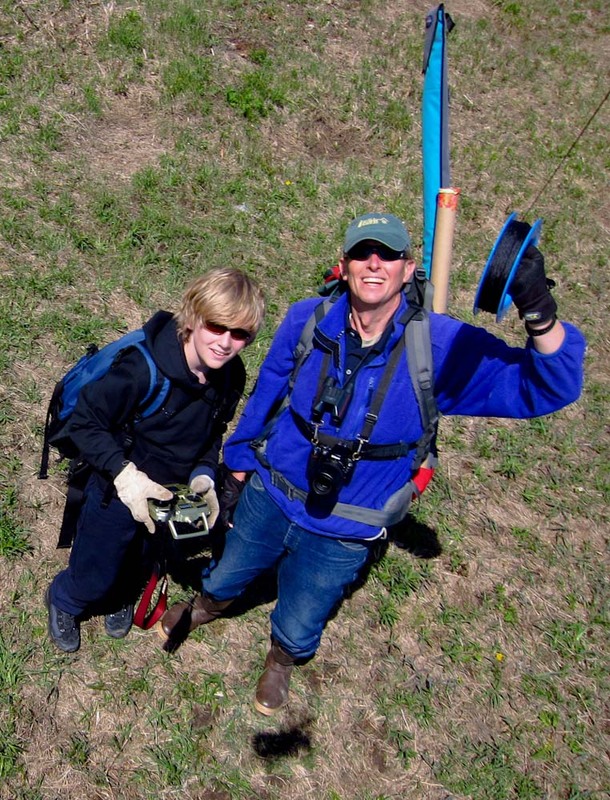 At first I thought his workshop on balloon aerial photography at the Fine gigapixel conference in November promoted a fringe pursuit – lofting cameras on tethered helium balloons to make better maps than were currently available. But this pursuit emerged from the elegant convergence of modern camera technology and traditional lofting methods (balloons and kites). It was now possible for anyone to make good, current “maps” from stitched, low-elevation vertical photographs. Jeffrey is committed to inventing workarounds to the technological and financial obstacles that would otherwise put this process out of reach of the communities that might benefit from good maps. This was the focus of his thesis at MIT, and he has had great success bringing communities together around these new map images and the experience of making them. He has made the objective so compelling, and the process so simple and inexpensive that I soon realized I had to try it.